Whether you like to plan out each day perfectly or simply go wherever the mood takes you, with the ability to hop between all the Disney Theme Parks throughout the day, this ticket really let’s you play Disney your way. 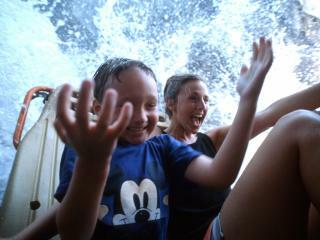 You can do as much or as little as you please - for example, take an early morning safari at Disney’s Animal Kingdom Theme Park, then a refreshing swim at a Disney Water Park in the afternoon, followed by the fireworks at Epcot in the evening – it’s up to you, and there’s no need to plan. Disney’s Fantasia Gardens Miniature Golf Course or Disney’s Winter Summerland Miniature Golf Course. Valid for one round per day. Round must start prior to 4:00 p.m. The Disney 7 Day Ultimate Ticket expires 14 days from first use so the ticket does not need to be used over consecutive days. With Memory Maker, your whole family can be in the picture at Disney PhotoPass locations as well as select attractions and dining locations throughout Walt Disney World Resort. Ride photos are included too! Capture Disney memories like your family posing together in front of Cinderella Castle, screaming down Splash Mountain, hugging Mickey Mouse and so much more. Forget about having to purchase each photo individual, with Memory Maker you can get digital copies of them all and download as many photos as you want as many times as you like! This amazing added value benefit is exclusive for UK and Irish customers pre-purchasing an adult Disney ticket. Memory Maker includes Disney PhotoPass photos and other digital content taken during the Memory Maker window and linked to the Memory Maker guest’s Disney account. If Memory Maker is sold or ordered in combination with a Park Ticket, the Memory Maker window for that Memory Maker entitlement will be equal to the usage window of the associated Park Ticket and will automatically begin upon the first use of the associated Park Ticket. The Memory Maker window will end upon the sooner of either the expiration or depletion of the park ticket. A MagicBand is required to receive certain attraction photos and other digital content. Photos and other digital content will expire pursuant to the expiration policy at mydisneyphotopass.disney.go.com/help-and-support. Valid theme park admission required for certain photo locations. Memory Maker is subject to Memory Maker terms atmydisneyphotopass.disney.go.com/memory-maker-terms and, if applicable, Family & Friends terms at https://disneyworld.disney.go.com/en_GB/park-experience-terms-conditions.. Disney is not responsible for missing, lost or damaged photos or other digital content. Book by 14 February 2018, for arrivals until 31 Dec 2019. On the gate price $199 correct as at September 2017 and is subject to change.